Firstly I would like to thank the Royal Welsh Agricultural Society for the invitation to judge the 2006 Show. It was an honour and privilege to accept the invitation, and the whole experience of the show was very enjoyable despite the very high temperatures, but congratulations must go to all the stockmen who put on a great display of cattle in difficult hot conditions. The Senior Bull class was led by Sundial Lewis who was very mobile for his scale and age, evenly fleshed with a good top and loin. Hirwaun Rooney came a very close second and was probably the best carcass animal on display, but on the day his locomotion let him down, although he did improve as the day went on. Third and fourth placed bulls just lacked the power and fleshing of the first two. Lewis went on to be Male Champion, followed by Rooney in Reserve position. Penwern Simon led the first young bull class very closely followed by Wroxall Shaggy (P). Simon displayed great power and correctness along with length and a good loin, while Shaggy was slightly less powerful but showed great breed character, and is probably one to look out for in the future. The third placed bull Heywood Statesman was very growthy and correct but just needed some time to fill out. First in the April bull class was Crugmelyn Shamrock, a long, well grown, correct young bull but just lacking flesh on the day. Second and third placed bulls also needed more time to develop fully. The senior cows were led by Pasturefields Mia, a big fleshy cow, maybe slightly too heavy in front, followed by Atlow Jennie, this cow making a good job of her calf at foot. Celtic Noelle led the junior cows over Crackley Cornelia 46P. Noelle was a very stylish milky young cow rearing a very good calf, and caught my eye as soon as she came into the ring. 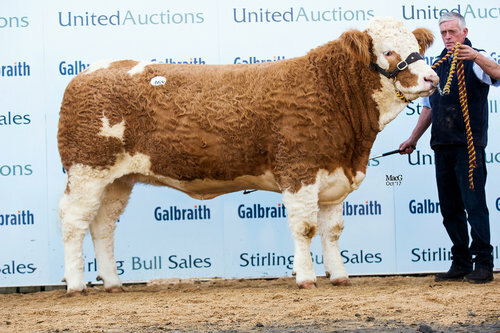 Shown by Wyn Jenkins & Gwyndaf Evans, she went on to be Female Champion. The strongest class of the day was the senior heifers led by Penwern Rachel, a long breedy looking, very feminine animal showing great character, closely followed by Crackley Cornelia 53R, possibly the widest and fleshiest heifer on display, but just too heavy and deep in the brisket and lacking that overall femininity. Three other very good heifers made up the rest of this class. Rachel, also shown by Wyn Jenkins & Gwyndaf Evans, was later placed Reserve Female Champion. Regency Superstorm, a long and clean, correct, well grown heifer led the junior class. I felt that the males on the day had the power and scale to be Champion and Reserve, and for that reason I chose Sundial Lewis from Meirion Jones and Hirwaun Rooney from Aled Davies respectively. Many thanks to the Welsh Simmental Club for the very kind hospitality shown to both Darla and myself throughout our time at the show, and sincere congratulations to all exhibitors, whether prizewinners or not, for the fine display of cattle.